The Congolese dancer Jolie Ngemi began dancing when she was three years old, in the Protestant church in Kinshasa and during hip-hop dance battles in the streets. 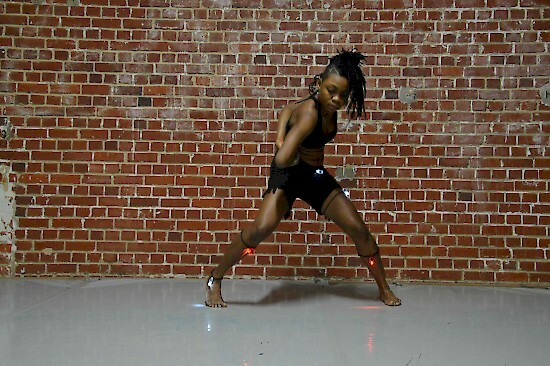 She combined traditional and experimental contemporary dance, until she ultimately arrived at The Performing Arts and Research Training School (P.A.R.T.S.) in Brussels to study dance. She worked with Thomas Steyaert, Boris Charmatz and Ula Sickle. In Identity n’a ngai, she devoted herself to the inaudible and invisible elements that determine our identity. Jolie Ngemi, who moved from Kinshasa to Europe, places the motifs of the language of Congolese dance – danced in the streets and at nightclubs – alongside the codes of Western contemporary dance. Her movements take on a dynamic interaction with the sounds of musician Rodriguez Vangama, complemented with field recordings from the night-time streets of Kinshasa. What does our identity look like? How does our identity take shape in front of the mirror and how do others determine who we are? Jolie Ngemi actively invites us as viewers to help answer this question.